Awards show season is in full swing and, personally, I can't think of a better way to spend a Saturday evening than by watching the Screen Actors Guild Awards. The nominee list is full of amazing performers from both the film and TV worlds, and Carol Burnett will receive a well-deserved lifetime achievement award — presented to her by none other than Tina Fey and Amy Poehler. As if that isn't exciting enough, E! News reports that Tony Hale (aka Buster Bluth on Arrested Development and Gary, the Prez's long-suffering personal assistant on Veep) will kick off the red carpet festivities with a Taittinger "toast." The show itself will broadcast live on both TNT and TBS — but if you don't have cable, you'll probably wondering how to stream the 2016 SAG Awards and the pre-show. Don't fret — there are plenty of ways to follow both the red carpet and the ceremony. In fact, TNT and TBS have been kind enough put a digital and social media plan in place so no one will feel left out during the Jan. 30 festivities. Added bonus? Turner has partnered with Amy Poehler's Smart Girls Initiative, so while you're perusing social media, be sure to check out the hashtag #SmartGirlsAsk — because it's fun to chat about fashion, but the Screen Actors Guild knows that attendees have plenty of other valuable things to say. It's a well-known fact that E! doesn't mess around when it comes to pre-show coverage. Hosted by Giuliana Rancic, Brad Goreski, and Zuri Hall, E! Online's red carpet coverage begins at 6 p.m. ET and will run right up until the actors take their seats in the Shrine Auditorium. If E! isn't your jam, head over to the SAG Awards official site to stream the red carpet. Although I can't make any promises for this year, in the past the official site has also been great about posting videos of winners' speeches fairly quickly. 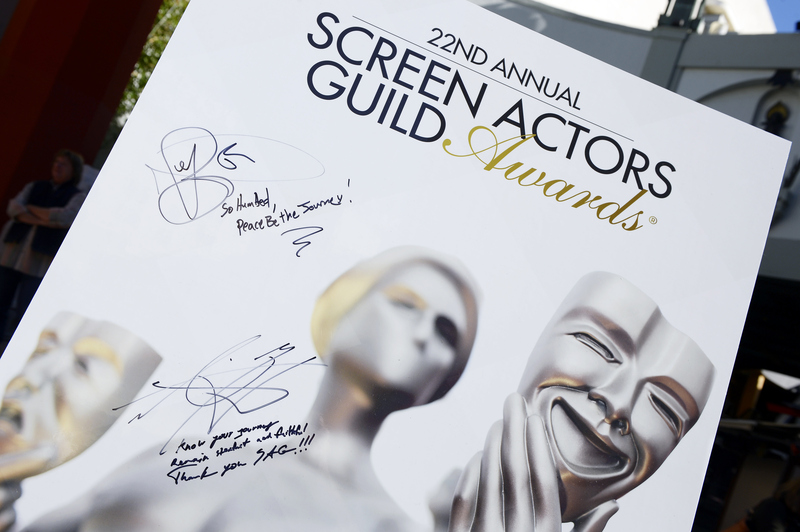 Once again, the SAG Awards Red Carpet Pre-show will stream on People.com starting at 6 p.m. ET. It will be hosted by People's deputy entertainment editor JD Heyman and entertainment reporter Caroline Moderressy-Tehran. Meanwhile, style & beauty director Andrea Lavinthal will be on hand to weigh in on the best and worst red carpet looks. Social media is always a great way to follow along for awards shows, but this year it'll be even better because the SAG Awards Social Media Team has appointed Scandal star Katie Lowes to serve as the show's Social Media Ambassador all evening. Check out her Twitter, Facebook, and Instagram for up-to-date coverage. And, of course, keep refreshing those Twitter and Instagram feeds using the hashtags #SmartGirlsAsk and #sagawards — all the best and worst moments of the evening (both red carpet and ceremony) are sure to appear on social media almost instantly. Happy viewing! Don't forget the popcorn.